This magical coast is a dream and we’ve found some superb secret spots for our guests on this memorable painting holiday in Italy. The peace of a private garden contrasts with the pace of Pompeii and the hidden gem of the ‘fiord’ beneath our hotel. Take a boat ride to Capri on your free day and paint in the Moorish gardens of Villa Rufolo. A short transfer takes us to Furore in time for a quick explore before dinner. We spend our first day in a delightful private garden that has a spectacular view of the Walk of the Gods. After taking in the panoramic views, we will enjoy a gentle day of sketching and loosening up. Pompeii is a unique location. As well as the amazing ruins and roads, exceptional frescoes are found throughout the city. A registered Pompeii guide will lead us through the city, and we will stop to focus on a fresco in Villa Giulia. Your tutor will talk about ancient colour palettes including Pompeii pinks ~ create your own ‘colour bar’. We will spend the morning in Atrani to explore and sketch textures and architectural features ~ doorways and archways ~ and enjoy the lovely views. In the afternoon we will head to Amalfi, a picturesque waterfront town with aristocratic houses, bell towers and churches of great artistic value. There will be a possible visit to a 13th century paper mill for those who would like to, and perhaps a little time for shopping! 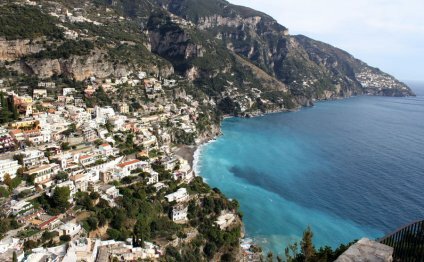 Pop down to the sea or enjoy a boat ride to the island of Capri or Positano, further up the coast. Alternatively, simply rest and restore in the hotel which is surrounded by vineyards, views and olive groves. Nearby our hotel, the fiord is a beautiful feature of the coastal landscape ~ a hidden ravine, with a small pebble beach and tiny marina for local fishing boats. The sea is brilliant teal and there is a lovely café selling the daily catch. It is a great favourite for artists as it is very quiet, peaceful with beautiful light. Ravello is beyond question, one of the most picturesque of villages along the Amalfi Coast. You will have a wonderful time painting and sketching the views. We will paint in the gardens of famous Villa Rufolo ~ the jewel in the crown of Ravello. It has been described as a ‘miniature Alhambra’ thanks to its Moorish air, cypress, lime and palm trees in the beautiful gardens. The lush plantlife inspires green, which Italians consider to be ‘urgente’ ~ enjoy colour mixing exercises. We depart early for Naples airport. Note: This is a selection of the many options available on this painting holiday in Amalfi. Weather conditions, group interests and the tutor will influence the final itinerary. From its panoramic position 450 metres above sea level and nestled into the hills, Hotel Bacco is a small, 3-star hotel offering breath taking views of the Amalfi Coast. Peaceful and secluded, Hotel Bacco is surrounded by vineyards and flowered gardens. For nature lovers, the hotel is within easy reach of the famous Sentiero degli Dei (The Trail of the Gods) and many hiking paths. It is a great base for exploring the rich surroundings, and is conveniently set between Positano, Praiano and Ravello. Hotel Bacco provides a welcoming atmosphere where you can enjoy individually designed rooms – some with lovely panoramas of this famous coast. The hotel is also known for its good restaurant with a panoramic terrace where you can admire the Amalfi landscape. A perfect location for these painting holidays in Amalfi. Some sea-view rooms are available at a supplement. Paint the iconic coastline with the wonderful Angela Corben! Sea view rooms available on request - supplement applies.